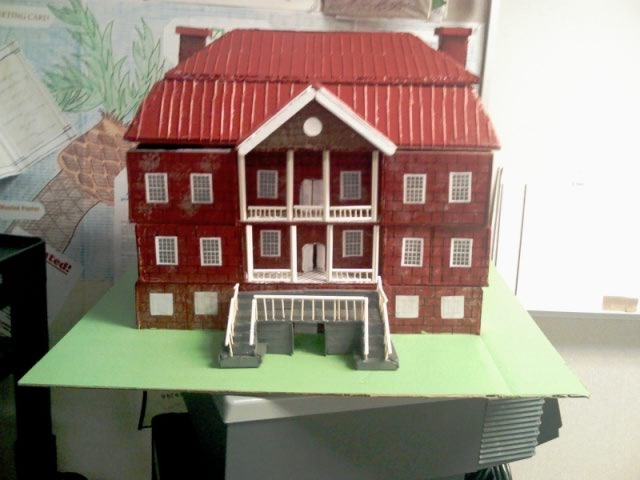 Using nothing more than cardboard, toothpicks, spray paint, and an abundant amount of hot glue, a team of students from Valley High School in Gilcrest, Colorado, constructed an impressive model of Drayton Hall for an assignment in their humanities class. This past November, seniors Deshawnda Chaparro, Tairyn Spindler, and Kelee Hamilton, elbow deep in historic drawings from the Library of Congress’ Built In America database and the Historic American Buildings Survey (HABS) collection, set about completing the detailed reconstruction. We chose Drayton Hall because it was an appealing house and a historic site. We especially liked that it didn’t have any extremely fancy appearances, so we didn’t think it would be that hard to construct—weren’t we wrong. We also liked how the house had been through so many ordeals, it has so much history. The history alone made the building even more exciting to present. For their attention to detail, the team received an “A” on their project. And in recognition of all their hard work, they also each received membership in the Friends of Drayton Hall so they and their families can visit the real thing. Congratulations Deshawnda, Tairyn, and Kelee! And thanks to Drayton Hall Project Assistant Joe Mester for directing the students to these online resources: Historic American Building Survey database.